A survivor of suicide loss is someone who lost a loved one due to suicide. An estimated 20 people are directly and intimately affected by a suicide (Survivors of Suicide Loss Task Force, 2015). In 2016, there were 134 suicides in Nova Scotia (Centre of Suicide Prevention, 2018). Putting these numbers together, an estimated 2,680 Nova Scotians were seriously affected by suicide in 2016 alone. Suicide has major impacts. It can be shocking and traumatic for family, friends and others. Guilt, blame, stigma and shame tend to surround suicide. Survivors of suicide loss may feel rejected or abandoned by their loved one and responsible for her/his death. Depression, confusion, anger and complicated forms of grief often occur in survivors. And suicide in one person can trigger suicide in another. Risk of suicidal behavior among survivors of suicide loss is higher. These survivors are much more likely to attempt suicide or even to die by suicide. 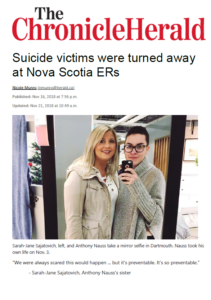 Nova Scotia currently lacks a coordinated, evidence-based provincial suicide prevention strategy. Without such a strategy, most Nova Scotians are left to deal with suicide’s aftermath on their own. Dr. Simon Sherry discusses survivors of suicide loss and appeals to Nova Scotia’s government to develop and to implement an up-to-date suicide prevention strategy.